Babe and Columbia in 1880 at the Cooper & Bailey winter quarters in Philadelphia. Columbia was born in Winterquarters in Philadelphia. Hebe was sired by Mandarin at The Great London Circus, which was purchased by Cooper and Bailey in 1878. 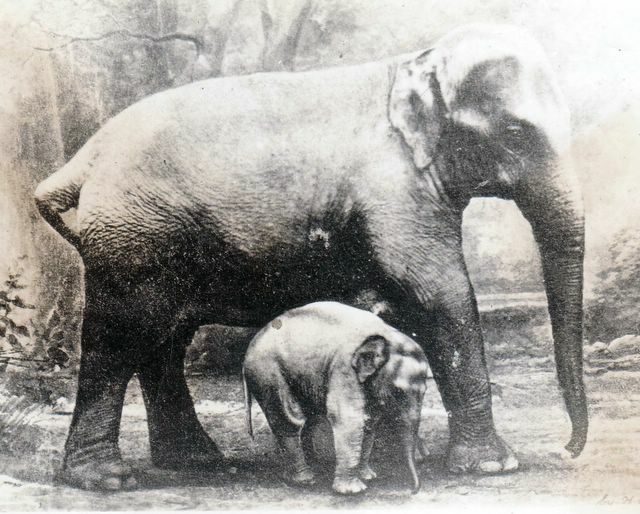 Although her mother, Hebe, commonly known about the show as Babe, was one of the best-natured elephants I ever knew, the daughter grew meaner and meaner as she got older, until in 1905 or 1906 she had to be killed. Mr. Bates, who was assistant superintendent of elephants for a long period of years, told me she inherited her vicious disposition from her sire.